It’s finally here! The most prestigious association football trophy, FIFA World Cup trophy, in the world has arrived in Kenya ahead of a two day tour. The trophy shall be received by President Uhuru Kenyatta at State House, Nairobi, Monday afternoon, with the public expected to have a chance to view it on Tuesday at the Kenyatta International Convention Centre. 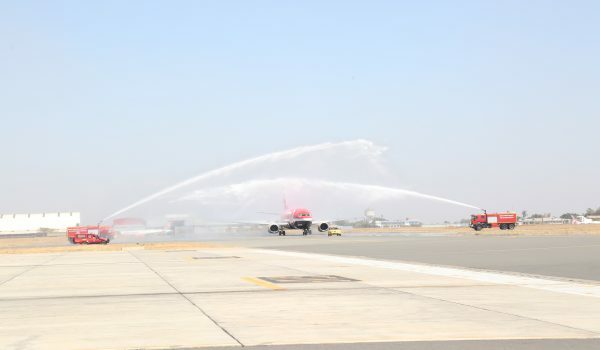 The trophy jetted in with a host of FIFA officials at the Jomo Kenyatta International Airport –JKIA Monday afternoon ahead of two-day tour in the country, which will allow soccer fans to spend time with it and take photographs. Ministry of Sports & Heritage Cabinet Secretary Rashid Echesa while at JKIA received the trophy, also in attendance of the high profile event was CS Tourism Najib Balala as well as Sports Principal Secretary Kirimi Kaberia. 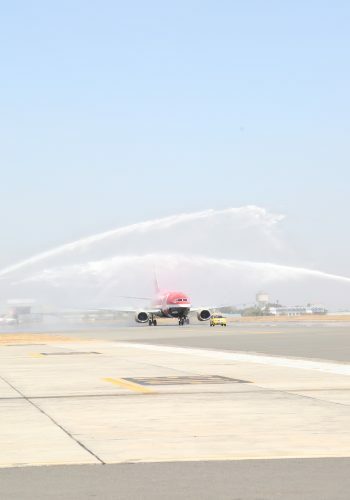 This is the third time the trophy has landed in Nairobi following similar stops in 2010 and 2013, ahead of the World Cup tournaments in South Africa and Brazil, respectively. It is the second trophy to be used in the World Cup tournament, after the first trophy, the Jules Rimet trophy, was stolen in 1983. Nigeria, Senegal, Morrocco, Tunisia and Egypt will represent Africa in this year’s tournament set to be held from the 14th of June to the 15th of July in Russia.